Yes, it’s a bit easier to buy a property if you use cash or if you use loans, but it’s NOT any easier to make money. If you make a mistake when you use money and loans, you risk your cash and you risk your credit. None of that is necessary. 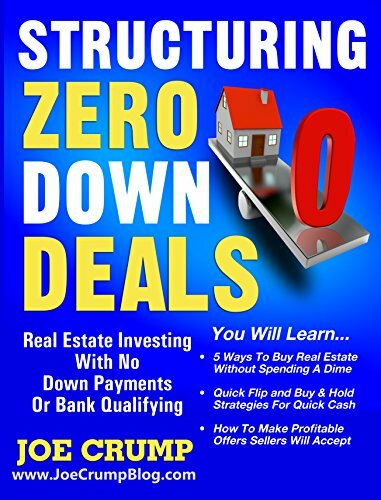 This book will show you Joe Crump’s, Zero Down Structure Hierarchy. It will teach you the five main no money down structures for buying real estate and will show you how to determine which financing structure to use for ANY kind of property. These techniques are perfectly legal and have been used all over the United States, Canada, the UK, Australia, Dubai, Abu Dhabi, Israel, many parts of Europe – and even in parts of the old Soviet Union. It works anywhere in the free world. You never need to use down payments or cash to buy properties again. In fact, Joe recommends that you never do a deal if you don’t GET cash when you close. Often that means thousands of dollars in your pocket for a few hours of work. Using these structures also means you will never need to use your credit again. No one will ever check your credit score or ask you to verify your income to buy these properties. I know it’s hard to believe, but Joe and his students have bought thousands of properties using these techniques over the years and he speaks with expert knowledge about the subject. This book will show you how to buy and sell properties with zero cash or credit and take chunks of cash every time you close a deal. It will also show you how to buy and HOLD properties using the same techniques. It will show you how to build a huge portfolio of property in a very short period of time. You will make money every time you buy a new ‘no down payment’ property and you will build your passive monthly cash flow with every property you buy. The beauty of this is that you can buy houses or apartments in any area, any price range and any condition. This book also includes a transcript of Joe Crump teaching a class how to use these structures. He gives example deals and shows how to structure each one. Once you learn these techniques, you will be able to make an offer on ANY property in a way that can make you a profit and solve the seller’s problem. You will also learn how to get a flood of very inexpensive, seller leads who would consider doing these kinds of deals and learn how to make offers to those potential sellers. Joe has been teaching these techniques to his mentor students and on popular real estate investing blog for almost 20 years.